Mordian 7th Regiment: Heresy Era Word Bearers - Zardu Layak and the Gal Vorbak painted! Heresy Era Word Bearers - Zardu Layak and the Gal Vorbak painted! The Word Bearers! Over the years I've done the most loyal of loyalists, and several misunderstood traitor legions, but figured it was time to do the full-on moustache-twirling-evil guys! While I will undoubtedly get around to painting Erebus and Kor Phaeron, my initial intent was to have a force led by Zardu Layak and his Blade Slaves, as I was really taken by the models. More or less followed the 'standard' paint scheme for them, with Zardu wearing the old greys, while his possessed bodyguards wear the crimson and silver livery of the late-heresy legion. The models that really got me into the project in the first place also marched across the painting desk over the last week - The Gal Vorbak are just extremely creepy models, and are really what the possessed marines ought to look like! I'm tempted to do a second five and try some conversions and kitbashing (so it's not just two of each guy). Great fun to paint! 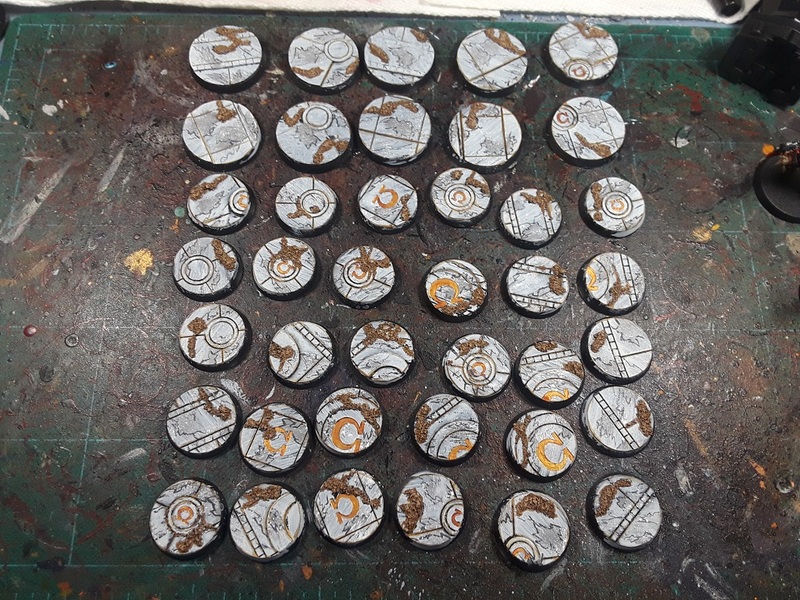 The intention is to do a force that was present on Calth, and as such I knew I wanted to do some faux-marble bases as befitting of the Ultramar worlds. Turns out Secret Weapon does a near-perfect set of bases for just such a theme! I added a little talus to them to rough 'em up a little (they're 'pristine' out of the package) and spent a fair bit of time trying out various techniques until I settled on one that I liked and could reproduce reasonably consistently. Of course, can't have a new project on the trot without a new painting chart, now can we? Working on the Ashen Circle next, pics to follow soon! Looking great! Those are fantastic Models, and I've been coveting them for a while, but until Possessed get better in 40K again, there's no way I can justify spending so much on them. The special bases for Calth are excellent too. I like that your dudes are going to be literally stomping all over Ultramarines iconography as they go around. And seriously on that pic at the top*. 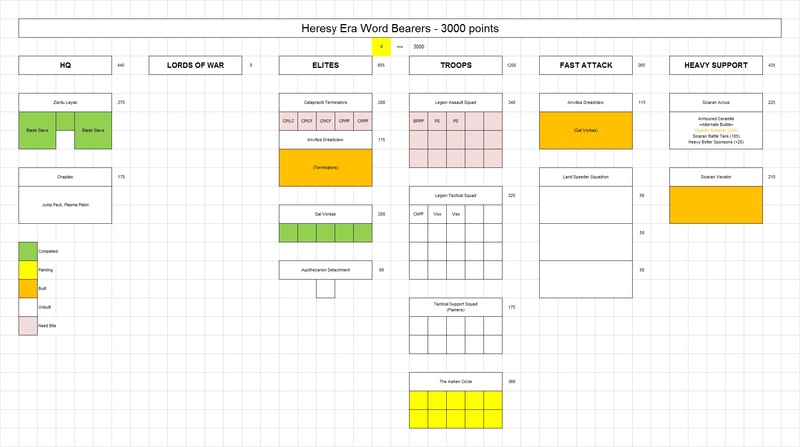 If more of the story were known, it would be more properly called The Erebus Heresy, not The Horus Heresy. He and Kor Phaeron basically fucked up the entire galaxy** for no good reason. *A Batman "Some men just want to watch the world burn" meme could have worked well there, too. **OK, in all fairness, the Necrons, Orks, and Eldar had already done some impressive work in that direction. 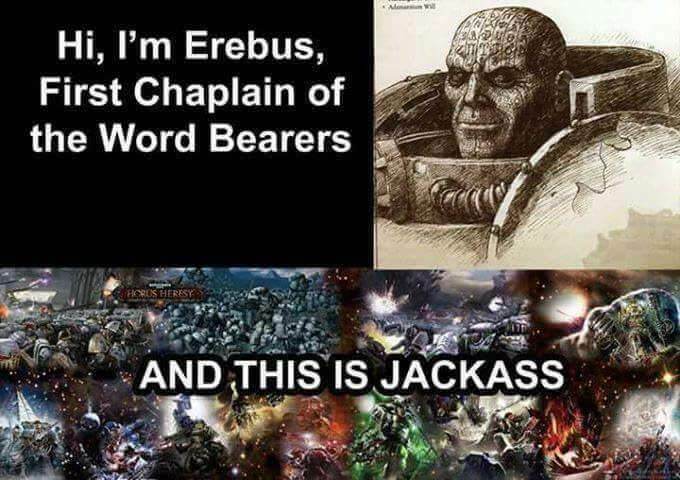 But when you follow the consequences of what Erebus started all the way through to modern 40K, it's still very arguably worse. Lovely minis! Although I'm now wondering how Zardu survived/escaped Calth to ultimately replace Erebus & Kor Pharon as Lorgar's trusted chaplain - I hadn't realised he was on Calth, even! Have you read John French's Slaves to Darkness yet? Zardu is one of the point-of-view characters in it (alongside Maloghurst and a few other Sons of Horus and an Iron Warrior), but he is perhaps the most unusual Word Bearer we've encountered (more so than the loyalists such as the vigilator). You also get more of an insight into his past and relationship with the two slaves, as well as his own company. If you have read it, what did you think? Cheers! I am just starting Slaves to Darkness, and really digging it so far! Yay Word Bearers! These are great! Do Argel Tal! Do Argel Tal! Looking good man! Was nice to see the base work happening. Cheers bud! Likewise, I was digging the Dark Eldar you were working on! Good stuff but man I couldn't get behind painting Word Bearers in the end. Good luck. The bases and idea behind them look ace. Indeed! I rather enjoyed the scene in ADB's Black Legion series where they first find out that the Big E is being worshipped as a god, and Horus laughs that Lorgar was vindicated in his earlier actions. Hah!